Stella Jones new children`s musical tells the story of the adventurous journey of two frogs, who try to stop the mad intents of the insatiable Madame Medusa. With the aid of their animal friends the frogs try to save the Rainbow forest while the landowner wants to build a new domicile at the old land. But the builders have to reckon with some surprises. Will the frogs succeed in saving the rain forest and can they convince Madame Medusa? 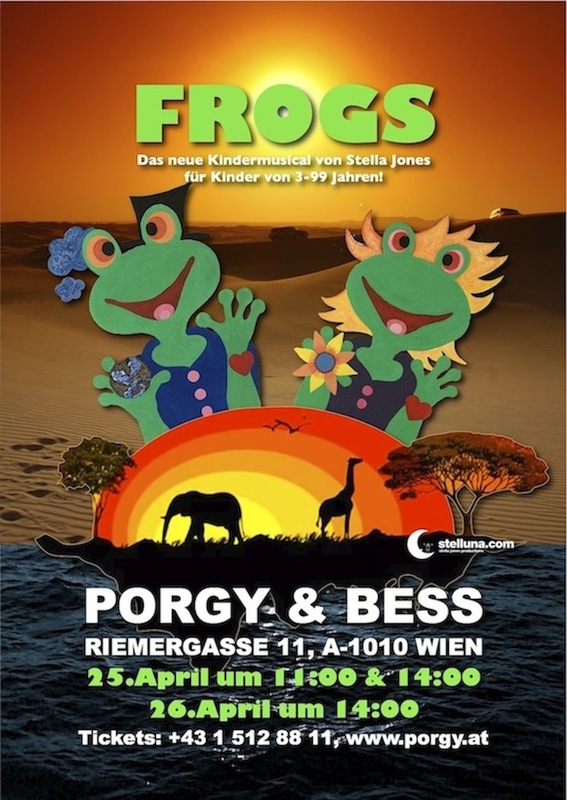 FROGS is a musical comedy for children from 3 to 99 years with humorous dialogues, life-size puppets and jazz, funk & soul rhythms, which animate the audience to dance. Performers: Barbara Gall, Kenia Bernal Gonzalez, Stana Hezoucky, Lilian Imina, Evi Jandrisits, Luna Jones, Megi Misanovic, Naima Jones, Nicole Rest-Lankmayer, Angelina Nigischer, Marie Ramedar, Manuel Stoff, Viktoria Tomic.